Micah loves to help. "Heping you, Mommy?" He asks. 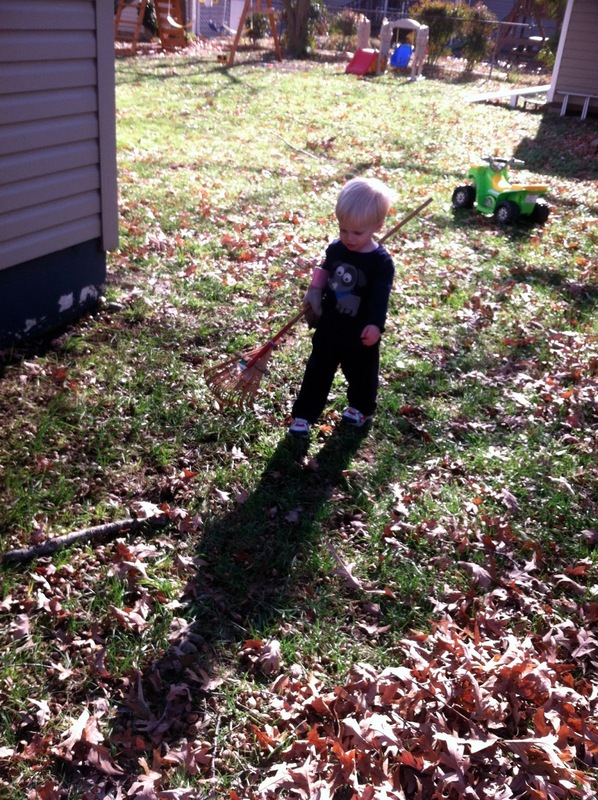 He loves to rake, do laundry, take the trash cans to the street, empty the dishwasher, sweep, clean the bathroom. If mommy is doing it, Micah wants to do it to. It is very sweet. Of course, a two-year old's version of "heping" is sometimes not terribly helpful. 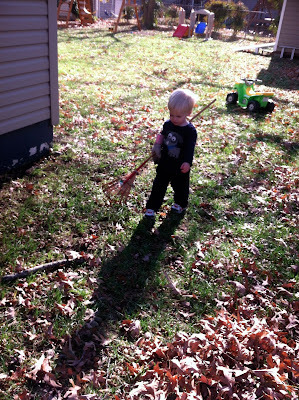 Very often, the chores he is helping with must be modified or simplified or redone. But his willing heart is just so sweet and it's worth a little extra work on my part to let my little buddy know that his efforts matter to me. Even my best efforts at living righteously are nothing apart from the Lord's help. And when this life is over, if I have served Him well, I will be able to lay my crowns at His feet. Sarah, I had not thought of "heping" in these terms before. What a wonderful perspective. God certainly does not "need" me and yet has chosen Broken, Incompetent, yet hopefully willing me to accomplish things for Him. Thank you. "Broken, incompetent, yet hopefully willing me to accomplish things for Him" - it describes us all! So grateful the Lord sees past our weaknesses and shows His strength through them! I had never thought of it in that way before... Thank you! I'm sure having little ones in the house you are perfectly familiar with not-so-helpful helping! I am right there with you. So grateful to God that He chooses to let me try and works in my life for His glory! Good insights, Sarah. So true! Thank you. There are so many parallels between the parent-child relationship and our relationship with God. I am grateful He gives us those little glimpses into His heart here on earth.